I grabbed this one off the shelf when I saw it because I immediately recognized the art to be by Kawahara-sensei, the author of another fun manga, High School Debut. I have a few series by her now, I have enjoyed them all. This collection of short stories is no exception. This volume contains three charming short stories originally published in Betsuma Margaret magazine. I feel, in this volume, you can see the author’s art transition from her earlier style, which was a bit messy, to something a little more polished, like what appears in High School Debut. You can see it on the cover as well. The art is very clean and colorful, much like the High School Debut covers. I really enjoyed the three stories in this book. 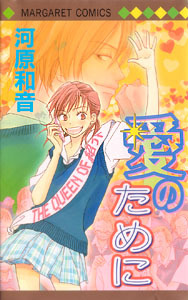 In the first story, also called “Ai no Tame ni,” our heroine, Hikaru, is a very popular girl. She has a ton of friends. It seems like she knows everyone! She has a great eye and memory for names and faces, and ever since she was young she has loved hanging out with all her many friends. Hikaru has put her network of friends and cheerful, outgoing, personality to good use by acting as a matchmaker. She had proven to have great success at pairing all of her friends up. In fact, they all call her by her nickname, MatchMaker Queen! Ah, but as you may guess, while Hikaru is great at pairing other people up, she herself has no boyfriend. While she does yearn for love herself, Hikaru also finds great happiness when she makes a successful match. She pretty much lives vicariously through their joy. One day, a rather surly looking guy and his timid friend approach Hikaru, asking for some help. The surly guy, Furuya, tells her that his poor friend, Oota, is looking for a girlfriend. Without further explanation, Hikaru pounces, shifting into a cute and lively mode, asking Oota questions about what type of girl he likes. Within moments, she has set up a group date, where she will introduce him to the perfect girl. Furuya is impressed and amused by Hikaru’s outgoing personality, and ability to gather people around her. When Hikaru offers to pair him off with a girl too, he scoffs at her, claiming to have high standards. He insults Hikaru, making her fuming mad. The nerve of that guy! Refusing to let her match-make him, he even said she will end up like an old spinster! What a creep! She can too get a boyfriend! Story 2 begins with some high school guys acting like a bunch of idiots (surprise :). They are making a dangerous bet. They all claim that our hero, Hashimoto, will not be able to kiss a girl he picks up off the streets within a month. If he does, they will each give him 1000 yen (about $10). Our hero is defensive and determined to prove to his friends that he can do it! Our heroine, Megumi, is the unfortunate target of his first pickup attempt. He really lucked out, because Megumi is a very naive girl. She goes to an all-girls school, and has never dated a boy. To Hashimoto (“Hasshi”)’s surprise, she agrees to go out with him! This unlikely couple hits it off right away. Megumi is cheerful, trusting, and adorable. Her personality fits well with Hasshi because he is very shy around girls normally, but for some reason he feels comfortable around Megumi. Soon they are dating and having a wonderful time. Megumi’s friends, a group of girls who are much less trusting than she is, can’t believe she is actually going out with a random guy who picked her up on the street. They are extremely skeptical over Hasshi’s good character, and just don’t want to trust him. However, Megumi really likes Hashimoto, and refuses to listen to her friends. She trusts him! But what will happen when she finds out about the bet? The last story in this book is my favorite. It is short, but very sweet, and I found myself saying “awww! how adorable!” out loud while reading it 🙂 It’s a Valentine’s Day story, but this time the author takes the typical story where the girl agonizes over giving chocolate to the boy she likes, and flips it around. This time the focus of the story is a boy who agonizes over if he will receive chocolate or not. Our hero is a guy named Mizubayashi, and the story is told from his point of view. Valentine’s Day is coming, and through his narration, he explains how all guys wish to receive chocolates from girls, and what they do to prepare for it (clear out a spot in their desks, walk home alone so as to be available to receive chocolate, etc.). Mizubayashi’s friends are all obsessing over the idea of girls giving them chocolate, even though neither of them have actually received any chocolate before. But they are desperately hoping this year wil be different. As for Mizubayashi, well, you wouldn’t guess it by looking at him, but he secretly wants come chocolate, too. He is a very tall, rather tough/cool looking guy, the type of guy that looks surly and might scare girls away. But on the inside, his thoughts revolve around getting Valentine’s chocolate. His chances of getting chocolate are slim, considering he doesn’t have a girlfriend. However, his thoughts focus on a girl named Ueda, who sits next to him in class. She is very cute and doesn’t have a boyfriend. Maybe she will give him some chocolate? As Valentine’s Day looms closer, Mizubayashi finds himself more and more preoccupied with thoughts of Ueda. He ends up helping her out of various situations. His friends accuse him of just trying to get on her good side so she will give him chocolate, but Mizubayashi insists that it isn’t true. However, his hopes skyrocket when he sees Ueda standing in line to buy some Valentine chocolate. Could it be for him? I found all three stories in this book to be delightful. They are short and sweet, non-smutty, the girls in them are normal, and in Hikaru’s instance, rather strong. The guys are all too cute for words. I especially like the surly Mizubayashi from story 3. If you like High School Debut, you’ll probably enjoy this book too!